UT alumna Diana Wilcox shows off her yoga skills at Breath & Body Yoga. Photo by Katie Arcos. Practiced all over the world, yoga has taken on a lot of other forms throughout its long history. Some yoga practices involve hanging from the ceiling in silk hammocks, and others involve making eye contact and laughing with a room full of strangers. Some practices are held in specially-designed studios equipped with custom-made heating equipment, and others are practiced in rented spaces tucked away in residential neighborhoods. But no matter what the practice or the setting is, all yoga has something in common — students use the 60-90 minutes of class to escape from the stress, anxieties and worries of their everyday lives. Each kind of yoga has its own distinctive traits, and everyone brings something different to their respective practice. The idea of yoga is universal, but the practice of it is incredibly personal. Though no one is quite sure exactly where and when it originated, it is largely accepted that yoga has been around for thousands of years and has roots in the Hindu, Buddhist and Jain religions, largely in India. The practices and principles of yoga made their way to the West in the late 19th and early 20th centuries, but it wasn’t until the 1960s that a yoga movement really took hold. Hatha is the most basic form of yoga, and the most widely practiced form of yoga in the world. 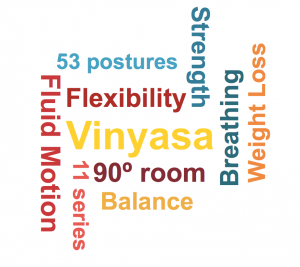 It focuses on movements and postures, or “asanas,” combined with breathing techniques that make up most of what we see in Western yoga practices. A lot of the practices that are popular today — like Vinyasa flow, Bikram and aerial yoga — incorporate or are inspired by hatha postures. We explored some of the yoga practices available in Austin — from traditional vinyasa flow classes taught in a formal studio, to a weekly laughter yoga class held in a South Austin neighborhood — to give a glimpse into the local yoga scene. Power vinyasa yoga, or Ashtanga yoga, is like a modern-day version of traditional Indian yoga practices. It was popularized by K. Pattabhi Jois, who started practicing yoga at age 12 in Karnataka, India, in the early 20th century. Pattabhi Jois studied under one of the great yoga gurus of his time and later went on to the Ashtanga Yoga Research Institute in 1948, which is used in teaching Ashtanga yoga all over the world. Pattabhi Jois spent a lot of his life as a yoga instructor at the Sanskrit University in India and teaching yoga classes to students in his home. Over time, these classes grew in size as his reputation in the yoga world grew. By 2006, Pattabhi Jois’ dream of opening a studio in the U.S. came true — the first Ashtanga-based yoga studio was opened in Florida. Today, Ashtanga-based yoga is taught all over the country, including Breath & Body Yoga in North Austin. 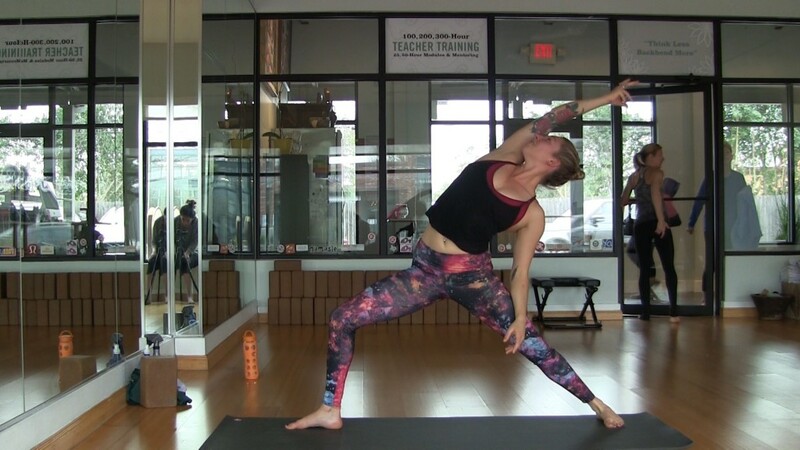 Unlike other types of yoga, like Bikram, power vinyasa flow yoga relies heavily on constant motion — students are encouraged to make each posture active, whether they are moving their bodies from one pose to another, or pressing into their mats with their fingertips to add extra energy to a more stationary posture. Desirae Pierce, owner and director of Breath and Body Yoga, taught the 75-minute vinyasa flow class I took in a heated room at her studio. Graphic by Katie Arcos, courtesy of infogr.am. Pierce emphasized the importance of practicing every day in order to maximize the benefits vinyasa yoga provides. Those benefits range from things like simple weight loss to psychological and mental benefits for people who struggle with anxiety or depression. Power vinyasa is not necessarily the best class for a beginner, like myself, to take for the very first time. Even though I run everyday, the class still felt intense. 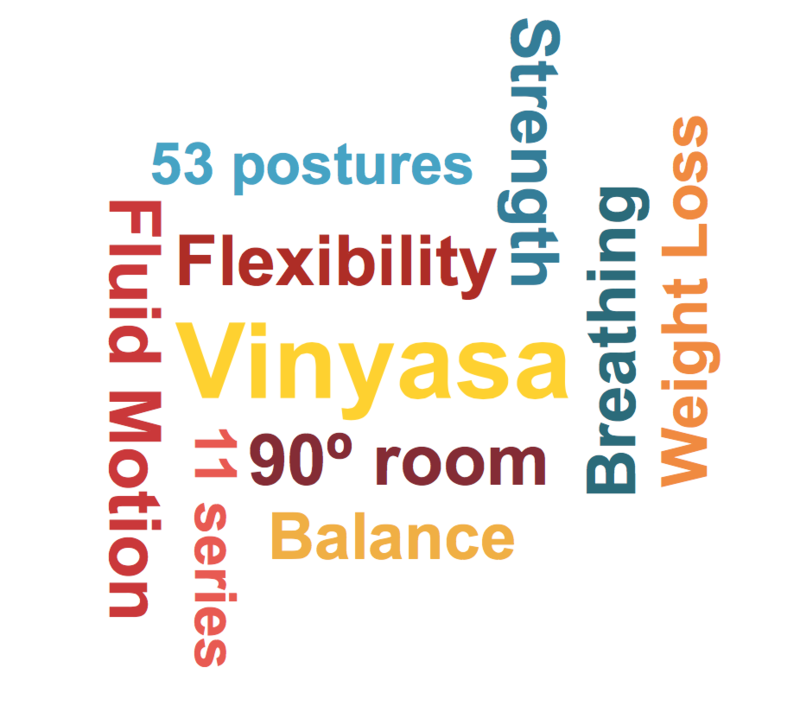 Vinyasa forces you to reach and extend your body to its fullest potential. The class was heated to about 90 degrees and challenged me from start to finish, and by the time it was over, I was sore in places I didn’t even know could hurt. Popularized in the early 1970s by one of the yoga world’s biggest celebrities, Bikram Choudhury, Bikram yoga is a highly-structured, highly-disciplined series of 26 postures that are performed by students in a room heated to 105 degrees at 40 percent humidity — conditions Choudhury claims are meant to mimic the environment in his home of Calcutta, India. The 26 postures — which are always taught in the same order, for the same amount of time and are always performed twice — derive from traditional hatha postures. Bikram classes are taught exactly the same all over the world, no matter what the teaching language is. Choudhury is notoriously possessive over his yoga, which he brought from India to the U.S. in the 1970s. For the first 20 years, he taught the classes himself. It wasn’t until the early 1990s that he started offering his signature nine-week instructor course, which is required for anyone who wants to teach his yoga in a certified Bikram studio. Mardy Chen, a Bikram-certified instructor and the co-owner of Pure Bikram Yoga, has been practicing this type of yoga since 1999, when she accidentally stumbled into a Bikram studio for her first ever yoga class. At the time, Chen was working in finance in New York City. But after that first class, she said she felt relaxed yet energized. For those 90 minutes of class, she completely forgot about the stress of her job. Three years later, she flew to Los Angeles for Choudhury’s instructor certification. Chen has since quit her finance job to make Bikram yoga her career. 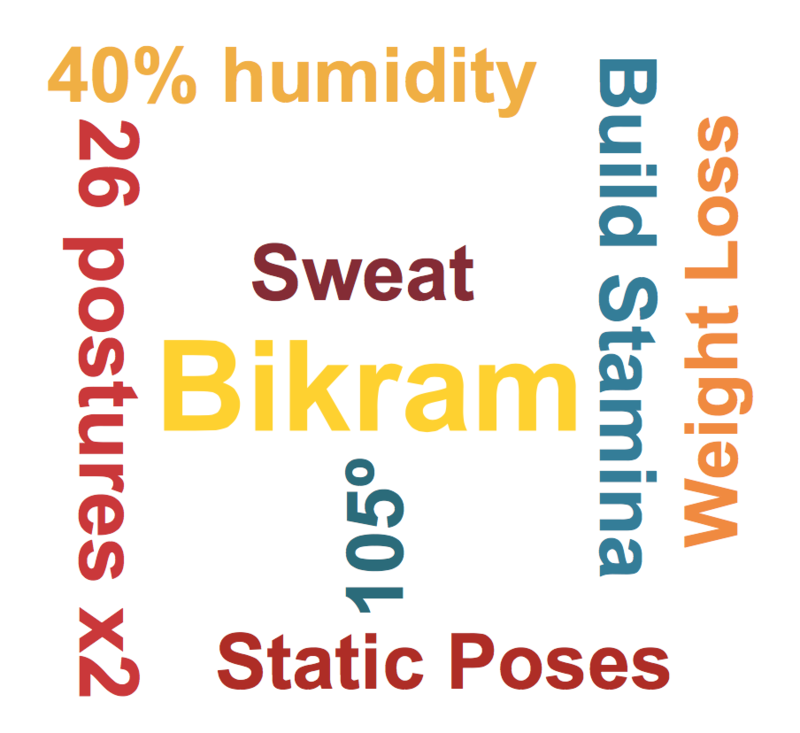 Like Chen, I was drawn to Bikram yoga for the structure. I wanted to be coached through a practice that I knew would be the same every day, no matter where I was. I also liked the idea of being in a room so hot you sweat immediately upon entering — it’s not dissimilar from walking around in Central Texas during the summer time. An aerial — or anti-gravity — yoga studio setup is an unusual sight. The room itself looks a lot like a standard yoga studio with wood floors and mirrors along one wall. But, unlike a standard yoga studio, multicolored fabric slings called hammocks hang from the ceiling. These are the contraptions that give aerial yoga its edge, and are what the students use to bring their yoga off the ground and into the air. Instead of the eastern hemisphere, aerial yoga comes from New York. Inspired by an acrobatic theater performance he saw Metropolitan Opera House, Christopher Harrison invented the anti-gravity hammocks in 1999. The idea to incorporate a new version of yoga into his hammocks came shortly after. Each hammock is made of several yards of soft fabric — enough to stretch out to accommodate an average-sized person suspended lengthwise — and is hung in a U-shape from the ceiling by a system of support chains and carabiners. These chains themselves are hung from reinforced ceilings like the one at Four Elements Aerial + Creative Movements. The entire setup for each hammock is designed to hold upwards of 1,000 pounds. Students use the hammocks to assist with the variety of postures practiced in aerial yoga classes, much of which are traditional hatha poses, such as Adho Mukha Śvānāsana, or downward facing dog. 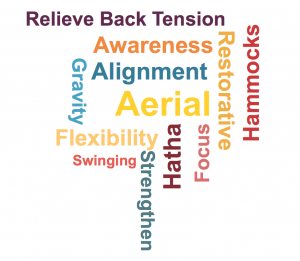 Suspending themselves in the hammocks allows practicers of aerial yoga to decompress their joints – spines in particular – to aid in performing the poses. By hanging from the air, students use gravity itself to achieve the proper postures and alignments of the poses. 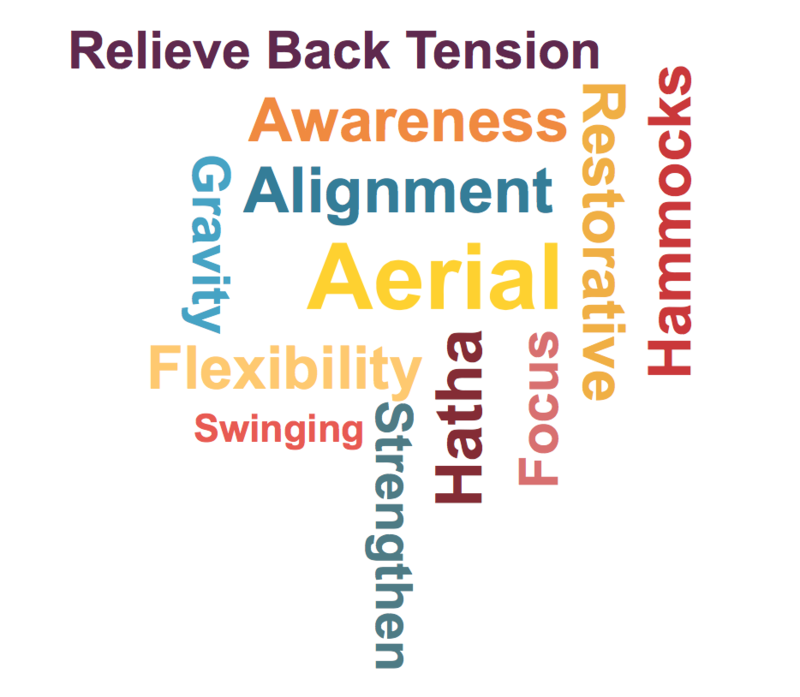 This is what I experienced in my 75-minutes aerial yoga session at Four Elements. I was able to rely on the hammock to help me achieve some of the poses our instructor, Lydia Michelson-Maverick, guided us through — though I was the least graceful person in the room by a long shot. Even so, it was fascinating to see what our bodies were capable of doing with the help of the hammocks. For as long as people have practiced yoga, there has been naked yoga. This “purest form” of the practice originated with the Naga Sadhus in India, who used naked yoga as a part of their spiritual practice to symbolize their renunciation of material and selfish desires, while emphasizing the natural connection of the body to the earth. Even without blatant spiritual implications, a naked practice naturally allows for the freest expression of yoga, leaving behind even the shirt on your back to focus solely on the body, the breath and the practice. Austin Naked Yoga celebrates its 10th anniversary this year, with over 200 regularly attending members and a mailing list about twice as large. The practice is male-only, since the co-ed or female-only classes couldn’t hold enough attendance to sustain them. The three weekly classes are led by different instructors — I attended the Saturday morning class, led by instructor Daryn Eslinger, who began teaching at Austin Naked Yoga after two years of attending classes. The entrance to the studio is blocked off by four or five blankets hanging from a clothesline. Behind this shield, the yoga students shed their clothing, stretch, meditate and prepare for class. The practice itself isn’t too intense — the postures stretch the body but never get too challenging to complete. The key difference, of course, is the lack of clothing. The Laughter Yoga Club’s movement was started twenty years ago by an Indian doctor named Madan Kataria. 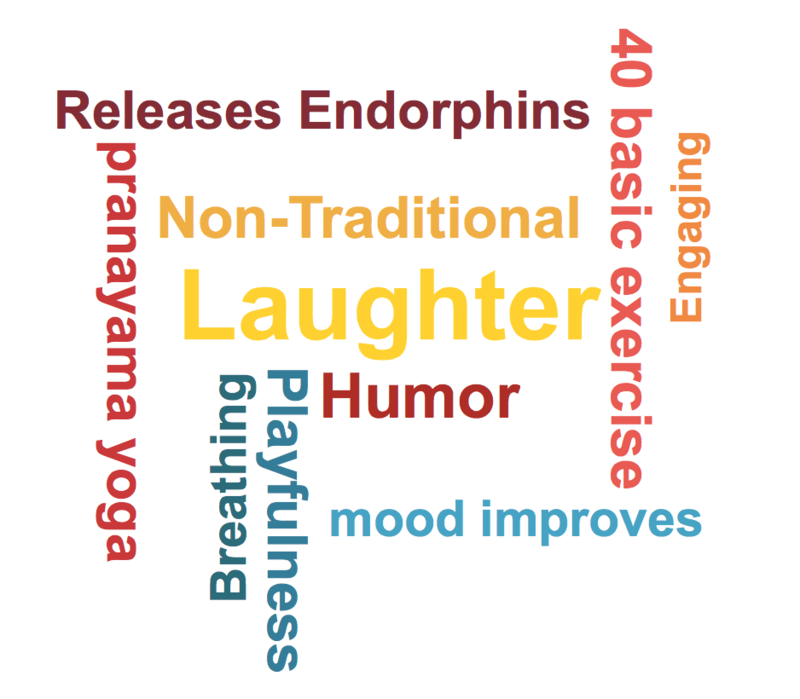 Kataria developed 40 basic exercises, which are now performed by everyone who practices laughter yoga. Linda Gillen, a laughter yoga instructor certified under Dr. Kataria himself, elaborated on the system. Gillen said there are over 7,200 laughter clubs around the world. 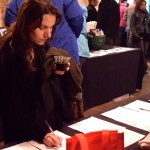 Most of the clubs, like the one in Austin, stay connected through group pages on Meetup.com. That’s how Alison Miner, another certified laughing yoga instructor from Bend, Oregon, found the Austin club when she moved here a few years ago. Miner noted that improvisation is also encouraged in laughter yoga practice. 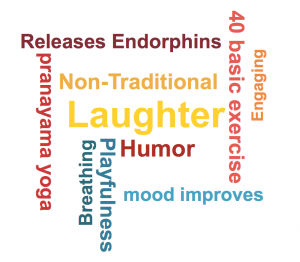 There are many benefits to laughter yoga. Gillen said that laughter — whether it’s genuine or false — releases endorphins in the body that trigger mood improvement. Laughter yoga also operates as something of a cardio workout, oxygenating the body and brain, and increasing feelings of health and energy. I felt these benefits during my session of laughter yoga, to an extent. It was extremely awkward in the moment, particularly because I personally put a lot of stock into comedy and what causes laughter, so it was strange to be laughing for no reason. 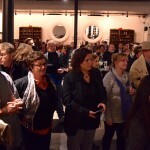 Two-steppin’, a rainbow of lights, and plenty of jolly conversation filled the Palm Doors of Sixth Street on Feb. 22. 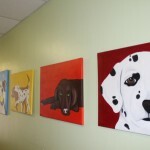 The nonprofit Austin Pets Alive! and its supporters gathered to celebrate Austin’s fourth year as a no-kill city, preventing healthy animals from getting euthanized. Cats struck a pose for pictures and dogs pranced around the venue while the humans cheered in their honor. It was an evening dedicated to acknowledging the hard work that has been put into saving animal lives – and ensuring its continuation. 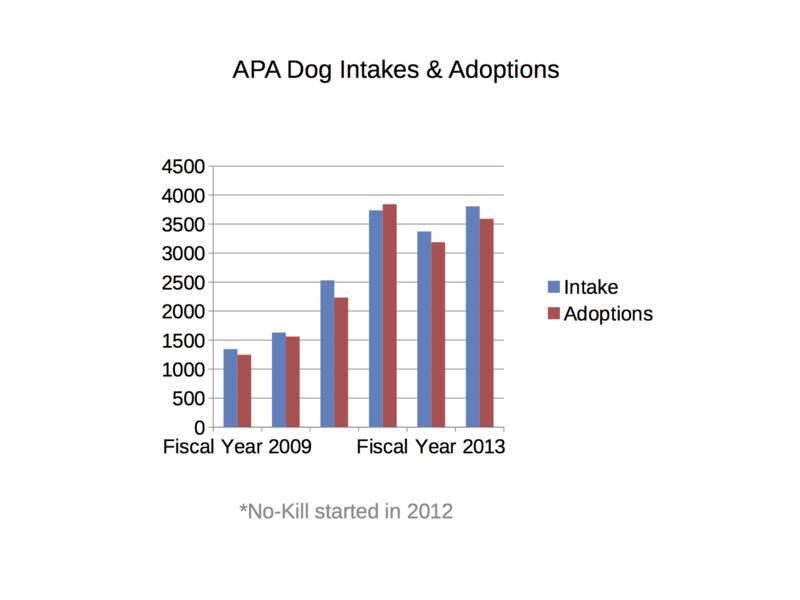 No-kill means 90 percent or more of the animals that enter the shelter system are saved. In 2010, Austin’s city council approved the no-kill implementation plan and in less than a year, Austin reached the 90 percent goal. Austin is currently the largest no-kill city in the United States, according to the APA! website. This achievement is a community wide effort. 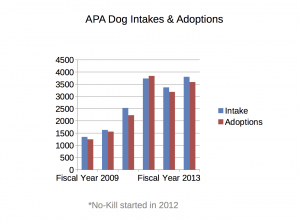 Adoption, fostering, volunteers and donations are key components to the success of no-kill. Reid said that it is necessary for the organization to appeal to the community to keep them involved. Prior to no-kill, the shelter would euthanize for space. 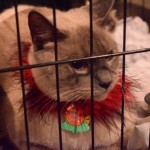 Even healthy, adoptable animals were put down. Now, Austin not only reaches the 90 percent goal for no-kill status – they exceed it. In January 2015, Austin Animal Center, the city’s municipal shelter, saved 95 percent of its animals. However, when more animals come into the shelter than leave, the shelter reaches overcapacity. The shelter partners with more than 100 rescues – animal organizations that aid the no-kill efforts – in the area, such as APA! 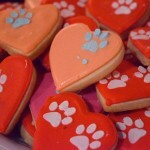 and Austin Humane Society. These rescues take animals out of the municipal shelter and help find homes for the homeless pets within their own network. But when capacity crises emerge, the shelters will resort to waiving adoption fees or promote two-for-one deals. Fraga said that they try to give an incentive for the community to bring the animals into their homes. To keep up with no-kill, funds are needed for extra food for longer stays and veterinary services for animals that arrive sick or injured. And for those community members that do care, they want their voices heard. The Animal Advisory Commission advises the council on all animal related issues in the city. They hear concerns from the public and address issues that are going on in shelters. Eight members of the community spoke at a commission meeting to share their concerns about the timely walking of the larger dogs housed at Austin Animal Center on January 14. 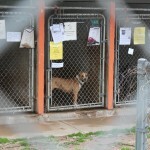 The community members said that a large number of the dogs go more than 24 hours without leaving their kennel. Some of the house-trained dogs get urinary tract infections from holding in their urine for too long. Other dogs may go “kennel crazy,” meaning a shift in personality caused by an excessive amount of time caged. One of the speakers, Austin Animal Center volunteer Will McKinney, said in an interview with KVUE, it’s a shame that the largest no-kill city in the United States has its animals sitting in kennels for 24 to 48 hours at a time. “I don’t think the burden should be put on volunteers, I believe volunteers are there to supplement,” he said. McKinney said that volunteers are solely relied on to walk the dogs and they are unable to keep up with the numbers. Volunteers said they feel there needs to be funding allocated to the dog walking program to require staff to walk the dogs twice a day, according to the Facebook page A Call to Action: Austin Shelter Dogs Need Your Help. The page reaches out to the public to raise awareness and to get the community involved, whether it is by writing to the city council or coming out to the shelter to volunteer. 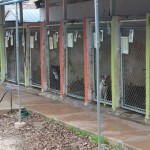 Volunteers cover about 23 full-time positions, said Kasey Spain, Austin Animal Center Spokeswoman. Their work includes helping with community outreach, animal socialization and with veterinary services in the clinic. The most prevalent volunteer program is dog walking. “We know there are some flaws with [the program] but as we get more animals and as we grow, we are kind of having to make adjustments to those things,” Spain said. The shelter has approximately six hundred volunteers total, but only about four hundred are active participants. Spain said that with more volunteers, the shelter is able to do more for the community, especially with an influx of animals in the shelter. Animal Advisory Commissions board member, Meghan Wells, said the dog walking issue will not be solved immediately, but she does see progress being made. One suggestion to fix the dog walking issue is RuffTail Runners, a running organization that is partnered with APA!. The organization trains their members to run or walk with high-energy dogs from APA! at Lady Bird Lake trails. Co-executive director, Rob Hill, said they have seen improvements in the dogs – they are happier and healthier. Austin’s no-kill status has only made their mission more meaningful. However, because Austin Animal Center is city-run and not a private nonprofit, there are issues with bringing the RuffTail Runners to the shelter. The runners will have to go through the registration process for volunteers, including filling out an application and getting a background check. If they do not register as volunteers, their opportunities are limited. “The city is its own beast and has its own requirements and regulations for most things, and it’s for good reasons, like public safety and risk management,” Wells said. 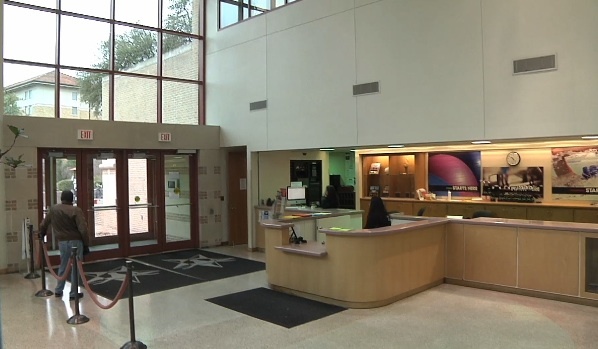 In the mean time, community members, the city and staff at Austin Animal Center are producing more ideas and brainstorming possible changes in hopes of reaching a solution. Wells said she imagines the Austin community will always be involved in the no-kill status and is glad that they are not content and are pushing for improvement for the city. With Austin consistently listed as one of the most pet-friendly places, according to the Austin American Statesman, being the largest no-kill city in the nation has left its mark. AUSTIN, Texas- Last spring, grabbing a tennis racket, a few balls and her phone, Lauren Marek planned to spend an afternoon at a few local tennis courts with her sister in her native Bellville. But after just a few lackluster games of tennis, Marek’s attention turned to where it usually is– photography. With her sister leaning over the net, reaching for a ball, Marek took out her iPhone and snapped a picture. Fast-forward almost a year and that same picture, after being posted on Instagram, found its way to a local and international art festival, One by One Texas, representing a much larger trend of mobile photography and social media. 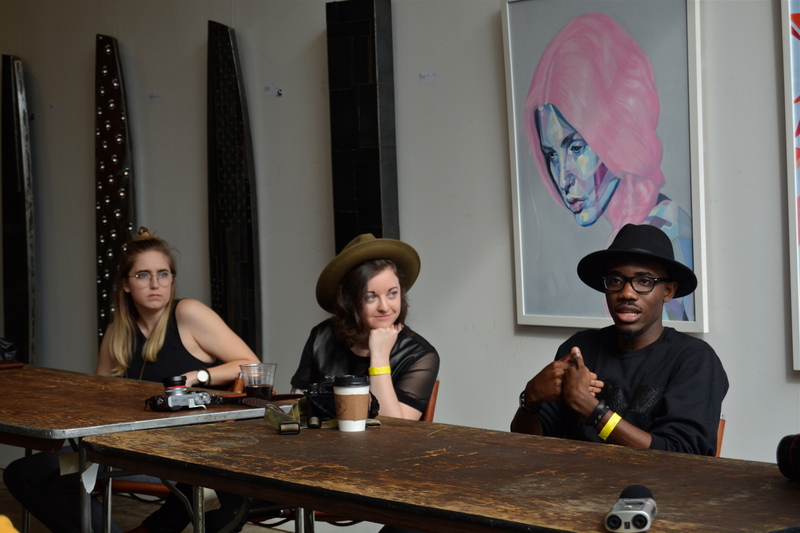 Showcased photographers Lauren Marek, Carra Sykes and Temi Coker discuss the inspiration behind their work during the One By One Artist Panel on Saturday, Feb. 21st, 2015 in Austin. “The reason for One By One is because I wanted to show the world the beautiful things you can create with just a phone,” Jeyson Paez, the founder of One By One, said. Since the most recent iPhones and smart phones have been released, mobile photography has been on the rise. Instead of using larger, more advanced equipment, artists and photographers have started a trend towards using mobile devices to capture moments. In turn, these photos have made their way onto more social media platforms, most specifically Instagram, a mobile photo and video app that was launched in 2010. One By One goers explore and take photos at Artpost Austin, a local gallery space where the festival was held from Feb. 20th- 22nd, 2015. The movement rises from the convenience and ability of using smaller devices. Since most people carry their phone on them at all times, artists can snap a picture whenever they need and instantaneously post it on social media. “Using Instagram for my photography has become a new opportunity to meet random people, and to also go up to people in the street and being like, ‘Hey, I like you. Can i take your photo?’ and hopefully having a nice interaction with them,” exclaims Carra Sykes, a photographer whose Instagram photo was chosen to be in the One By One gallery. One by One Texas, which was held from Feb. 20-22 in downtown Austin, focused on this rising effort. 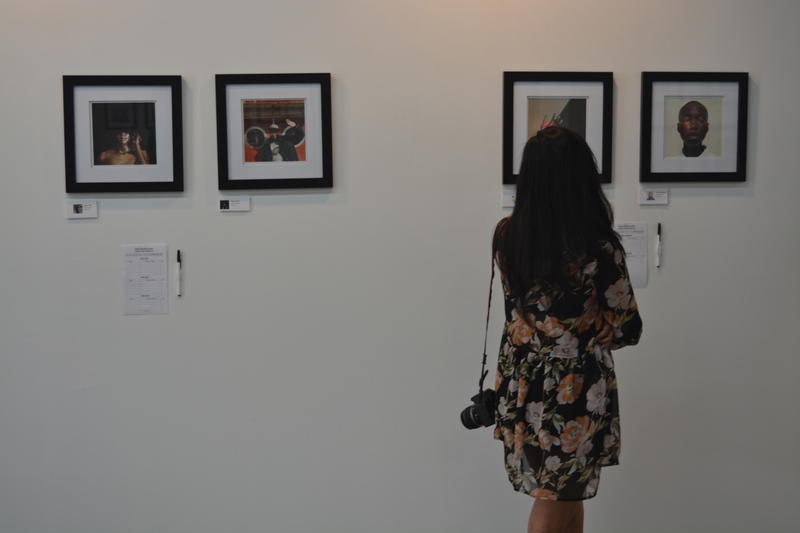 The festival is a statewide art show featuring mobile photography from artists ranging from Texas to Asia. 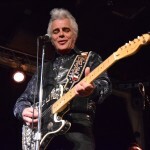 Currently in its third year, the festival, which started in Dallas, focuses on showcasing artists that try and capture specific moments to them using just their phones. 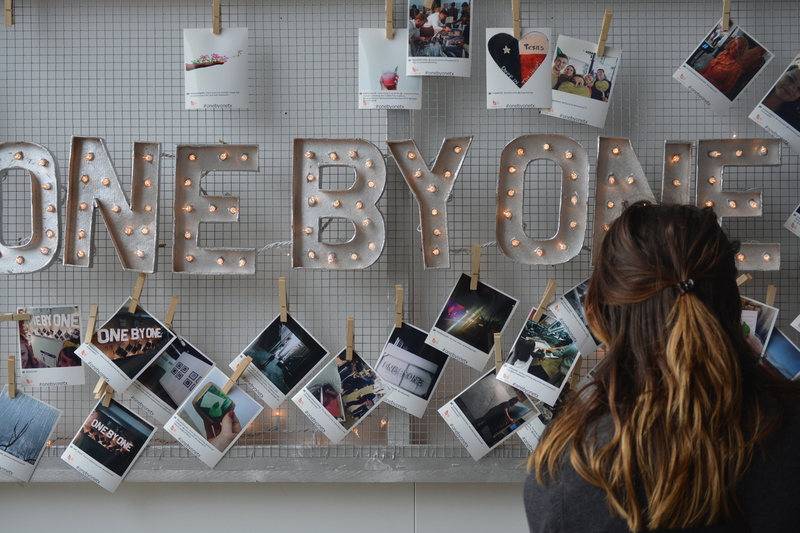 One By One TX Instagram Festival from Jewel Sharp on Vimeo. The show consists of 100 photos, all from Instagram, that highlight some of the apps’ most known figures. Fifty of the artists were chosen from across the United States while 40 are international. The last 10 pieces were chosen from a selection of photos turned in from other local artists. Free to the public, the One By One Art Gallery featured 100 Instagram photos taken by 100 different photographers with only their mobile phones. Feb. 21st, 2015. Austin, Tx. Most mobile photographers use the phone’s basic camera features to take photos then download other, more advanced apps to edit. 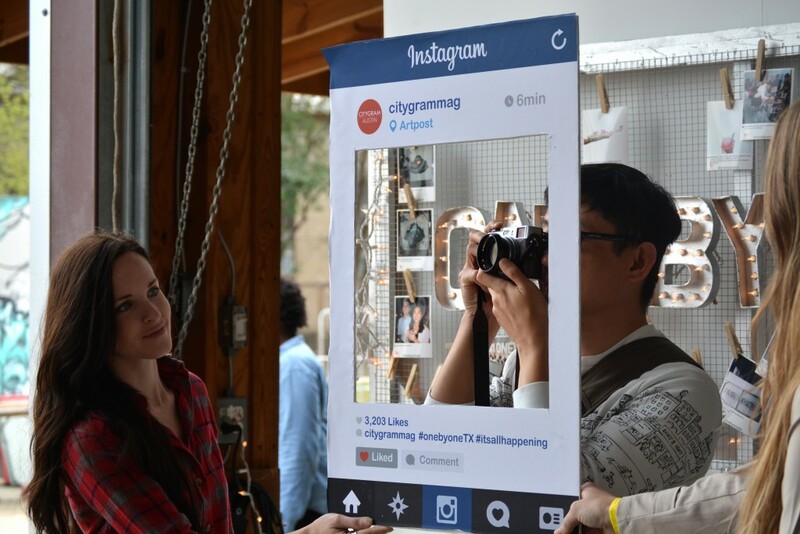 These apps vary from VSCO Cam to Litely or even Instagram itself. This simple process of mobile photography allows new and inexperienced photographers to create their own content and have a wide range of ability without the purchase of traditional photo equipment. In addition, social media has further progressed the movement. Sykes and other artists have the ability to instantly post any photos on platforms such as Twitter, Facebook or Instagram to share their work without hassle. 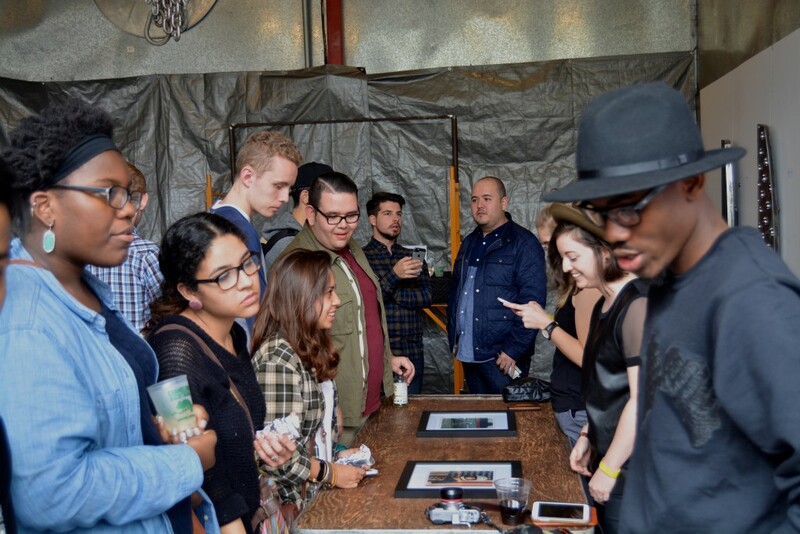 One By One Festival goers meet and greet with featured Instagram photographers during the artist panel on Saturday, Feb.21st, 2015 at Artpost Austin. In turn, their names and works have become well known through the photography and Instagram communities, allowing them to gain more work opportunities or create new business ideas. Brent in his North Austin industrial kitchen finishing up a batch of grapefruit sorbet. What would prompt a man to walk away from a six-figure income? Winning the lottery? Or receiving a massive inheritance from a distance uncle? 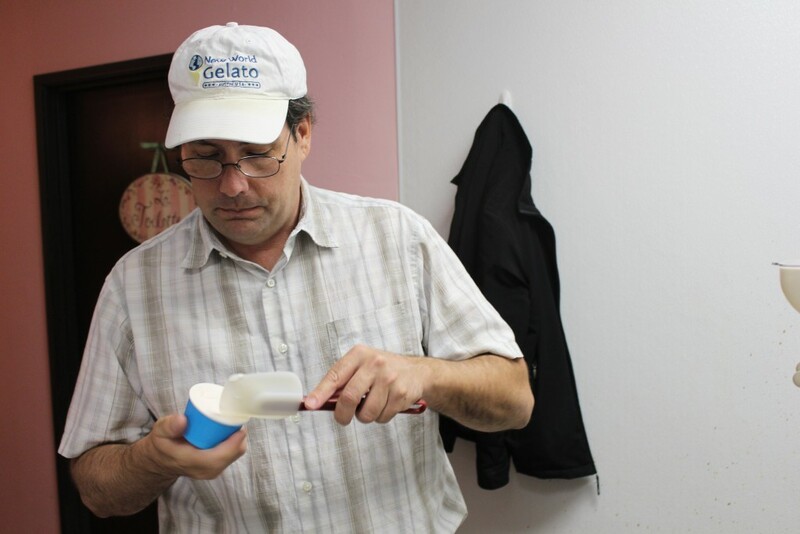 For Brent Petersen, it all started with a trip to Italy more than a decade ago. Kathryn Vasquez, known to her friends and coworkers as “Kat,” is but one of the many students on campus suffering a major blow from the school’s recent Affordable Care Act adoption. Vasquez is an advertising student at the University of Texas In August, she, along with three fellow coworkers, were promoted to program assistants at the Recreational Sports Center—one of four rec centers located at the University of Texas. As a program assistant, Vasquez takes on multiple tasks on a weekly basis. The four-person team creates semester-long schedules for three facilities they oversee. Additionally, program assistants must complete payroll twice a month to ensure that all employees under their supervision are paid accordingly. Furthermore, Vasquez is scheduled to work three shifts a week. Needless to say, she has got a lot on her plate. Just when you think this hectic schedule couldn’t get any worse, we learn that Vasquez must accomplish all these weekly tasks as well as attend her weekly shifts without surpassing 19 hours a week? Vasquez is but one of many students who have experienced major changes within the year and a half. In December 2013, students working on campus were privy to speculation of the University scaling back on student-employee hours. The rumor had students like Vasquez deeply worried, and quite frankly in a panic. Olivia Ruiz, a former student-employee at the University of Texas shared the hardships she was expecting to face once the school mandated the campus-wide audit that would limit employers to scheduling student-employees to 19 hours of work a week. The 19-hour limit would run from Monday to Sunday. Like Ruiz, Vasquez is paying her way through school. Her job on campus is the main source of income. Vasquez is aware of the recent changes in light of the push for Obamacare. “I just wish we had the ability to opt out if we’re already insured,” said Vasquez. Meredith Duncan, also a student at the University of Texas is pursuing a degree in Business Management. She works in the business office located at Gregory Gym, the largest indoor satellites facility for the Recreational Sports Program on campus. Since becoming an employed student on campus, Duncan has been restricted to working no more than 19 hours a week. To her knowledge, students do not typically work more than the allotted amount, with the exception of special circumstances. These special circumstances may include part-time students or seniors registered for few classes. Duncan noted though, that recently she has been asked to clock in a few extra hours, surpassing her weekly average of 16 hours a week. She expressed discomfort about having to take on extra hours at work due to the fact that she’s a full-time student at the competitive business school at her university. When Duncan talked about the hour limit implemented at the University of Texas, she discussed the University’s intentions to push students to prioritize school over work. “UT has a policy, you cannot work over 19 hours a week to make sure you are working on your school work,” says Duncan. When asked if she believed the reduction in weekly hours was harmful, she fully supported the thought behind the hour restriction. Duncan explained that when she initially began working on campus, her supervisor emphasized the need to restrict student-employee hours in order to allow them to adequately focus on school. In 2009, Presid ent Obama shed light on the alarmingly high rate of uninsured Americans at the time. What struck a chord with many was the way Obama depicted a situation that could happen to anyone at any time. According to a speech given in early September of that same year, Obama claimed one in three Americans went uninsured at one point in their lives. He also talked about how easily health insurance could be lost. Since its implementation, the Affordable Care Act has stunned many disbelievers. Although the numbers haven’t yet been made official, the total percentage of uninsured Americans has decreased significantly. According to the New York Times, there’s been a 25 percent reduction of uninsured residents. That roughly represents around 8 to eleven million Americans. Of that 25 percent, half have applied and been approved for Medicaid insurance. As a result of the act, several states broadened the eligibility for insurance to those earning a relatively low income. Additionally 3 to 4 million young adults have become newly insured. Many question whether or not the A.C.A. has improved or hurt the health industry. After serious scrutiny, Wall Street analysts and several experts in the health industry have drawn the same conclusion—the health industry is thriving as a whole. With many citizens becoming newly insured, business is being brought to several spectrums of the healthy industry. New clients are filing in to insurers. More and more patients with the means to pay are being seen in hospitals across the country. There have also been more Americans seeking prescribed medication as a result of affordable consultations. “The irony is if you look sector by sector, the A.C.A. has resulted in pretty substantial earnings across the board,” said Paul H. Keckley, a managing director at the Navigant Center for Healthcare Research and Policy Analysis. Shiner miso ramen is served at East Side King. When someone mentions the Japanese comfort food ramen, what usually comes to mind is a square package of cheap, freeze-dried almost-noodles with a shake-in packet of some protein-flavored “broth” that broke college students buy in bulk. This is not that ramen. This ramen is made with thick, hand-cut noodles in a rich broth with heaps of toppings such as beni shoga pickled ginger, chiasu pork shoulder, kikurage mushrooms, and, in one case, Shiner Bock beer foam. To compare these gourmet dishes with what HEB sells for 35¢ per pack is like comparing The Godfather II to Grown Ups 2: Both are “movies” in that they are sound and video together on a screen, like both “ramens” are essentially noodles in a bowl of steaming broth. 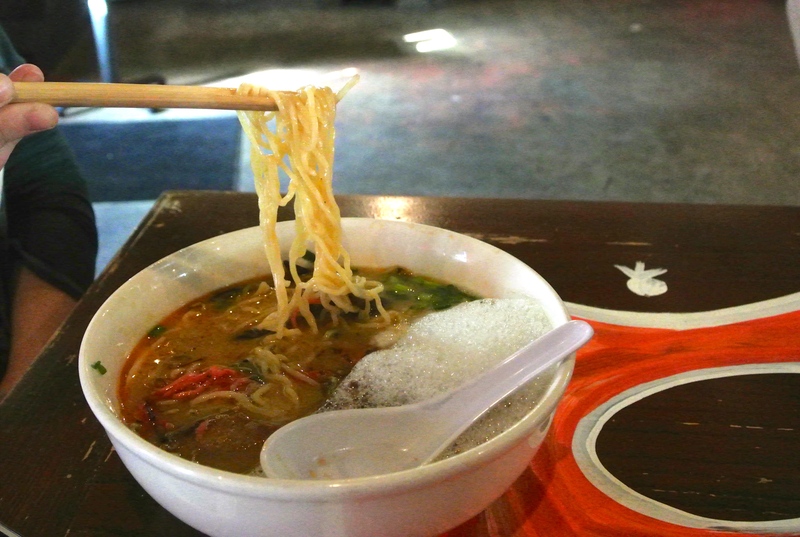 Since 2012, the gourmet ramen craze has taken Austin by storm. Places like Ramen Tatsu-Ya, Daruma and Michi Ramen, consistently rated among the best in the city, keep their ramen traditional, while others, like Top Chef winner Paul Qui’s side project East Side King, create a fusion of flavors not often found in a bowl of noodles. David Cardena, general manager of East Side King at Hole in the Wall, said he considers their ramen to be specialty fusion, or what he calls “traditional with a twist.” He said he thinks ramen as a trend has caught on in Austin because it’s foreign to most Americans. Unlike more conventional ramen dishes, like the pork-based Tonkotsu Original at Tatsu-Ya or the chicken/fish-based Shoyu Ramen at Daruma, East Side King at Hole in the Wall serves three distinct ramen bowls: the aforementioned Shiner Bock miso ramen, which is their take on “traditional” ramen; the chicken tortilla ramen, made with a Tom Yum shrimp base; and the Kimchi ramen, complete with spicy kimchi and pork belly. David Cardena makes a bowl of Shiner miso ramen. 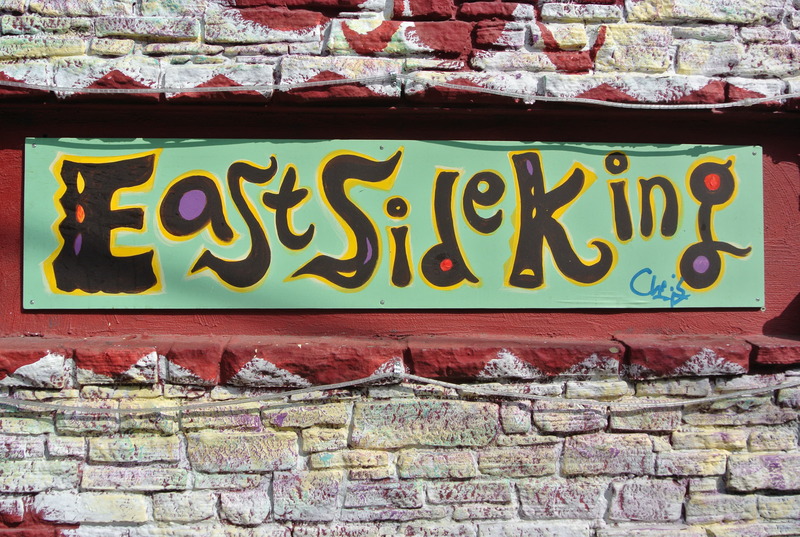 East Side King uses many offbeat ingredients for their fusion dishes. Guy said he realizes the ingredients they use might be intimidating for first-time eaters, but that shouldn’t dissuade those interested in eating. 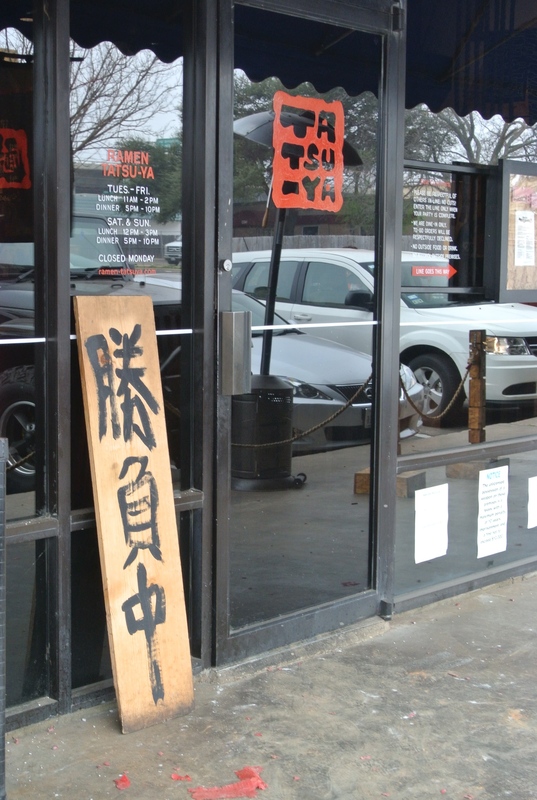 Ramen has caught on in Austin because it offers a change of pace, according to Guy. 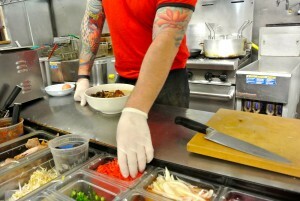 One East Side King customer, Brian Jones, said the ramen there stacks up to authentic Japanese ramen. 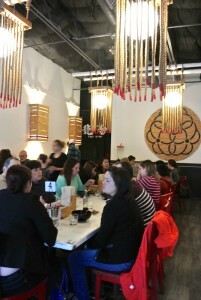 Ramen Tatsu-ya stays extremely busy during their lunch and dinner hours. Shion Aikawa, who created Ramen Tatsu-Ya with his chef brother Tatsu and fellow chef Takuya Matsumoto, said in a 2014 article on Munchies — Vice Media’s food blog — that the cuisine in Austin is changing for the better, since returning to the city after moving to California and Japan in 2005. Austin’s shift in food climate can be attributed to residents becoming more culturally aware, according to Aikawa. With over 110 people moving to Austin every day, people with different and even multiple cultures live side-by-side. Ramen Tatsu-Ya and Michi Ramen were unable to comment by press time. Ramen Tatsu-ya is another popular ramen restaurant that serves traditional style ramen. 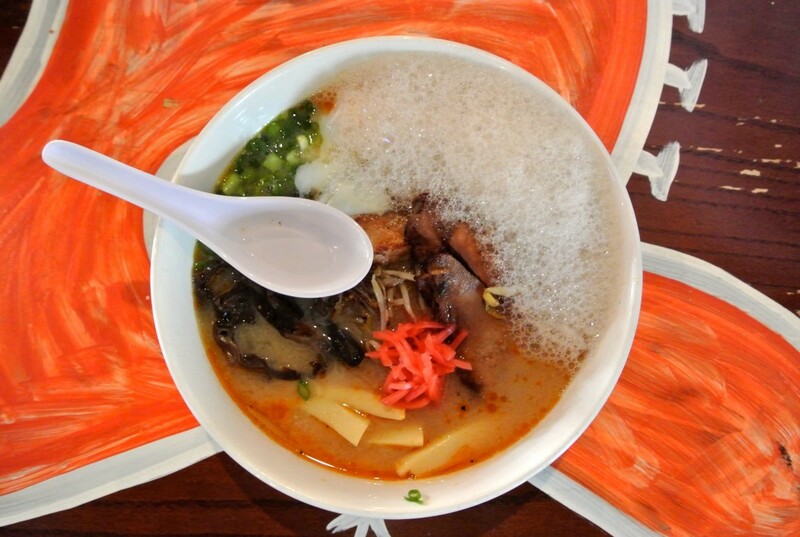 Shiner Miso Ramen is a specialty at East Side King that should be consumed with chopsticks. 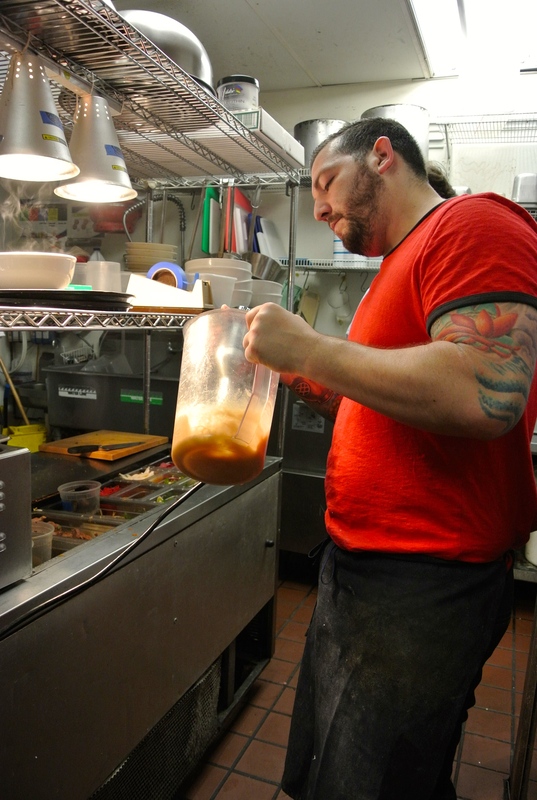 David Cardena whisks Shiner beer mixed with soy lecithin, to collect the foam for the Shiner Miso Ramen. 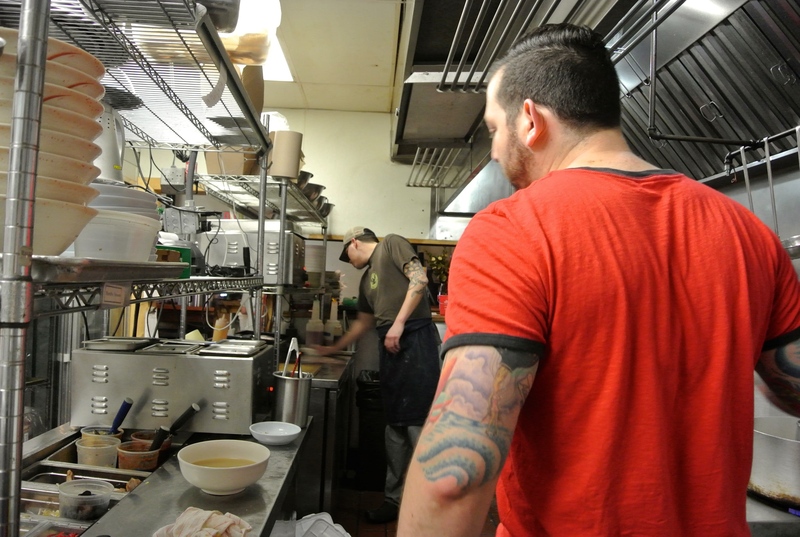 David Cardena and Justin Guy, fry and ramen cook, work in a small kitchen together at East Side King. 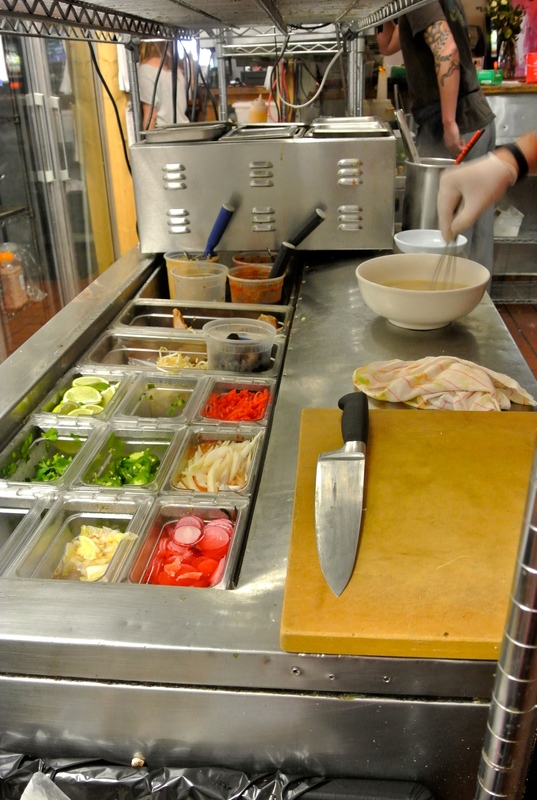 There are many ingredients that go into your specialty ramen at East Side King. 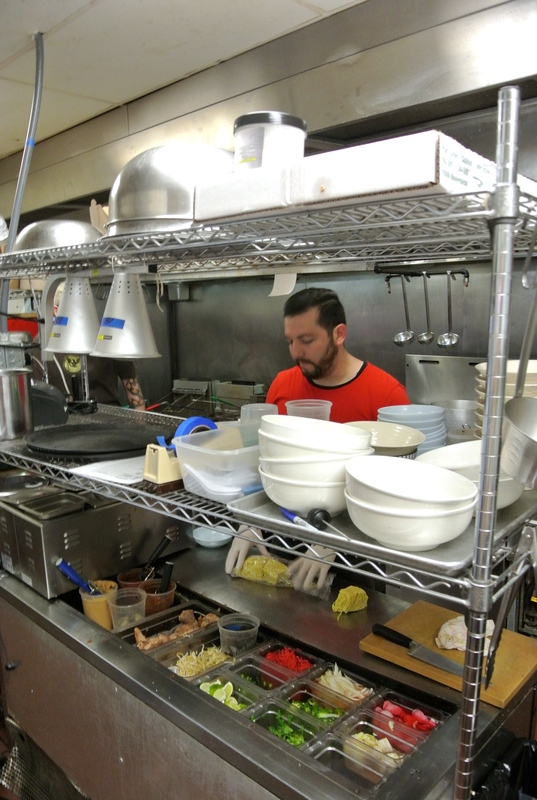 David Cardena, the manager at East Side King is showing the preparations for making ramen. 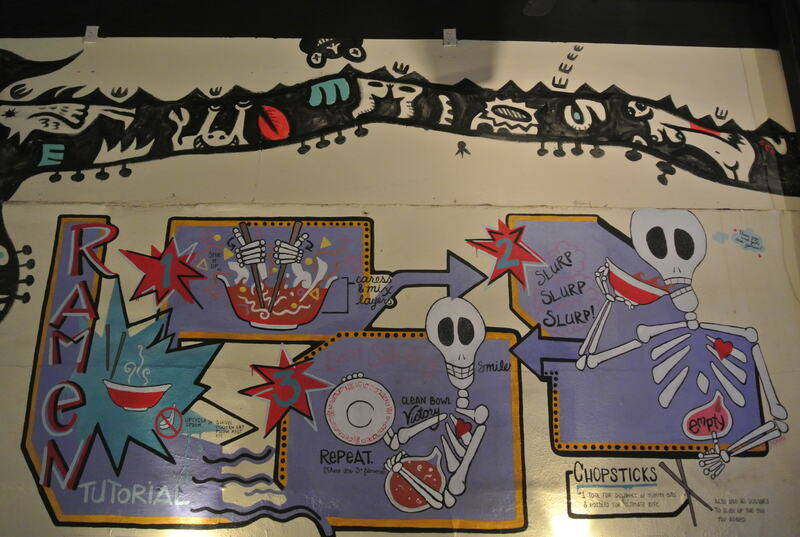 A mural in East Side King shows instructions for how-to enjoy your ramen. East Side King serves specialty fusion ramen. Convinced the alcohol industry is a man’s world? Think again. Women have been slowly taking over this profession since the early 1980s. Whether it’s bartending or brewing, women of all ages seem to be drawn to the mixology movement, which has turned drink mixing and brewing into a truly innovative craft. 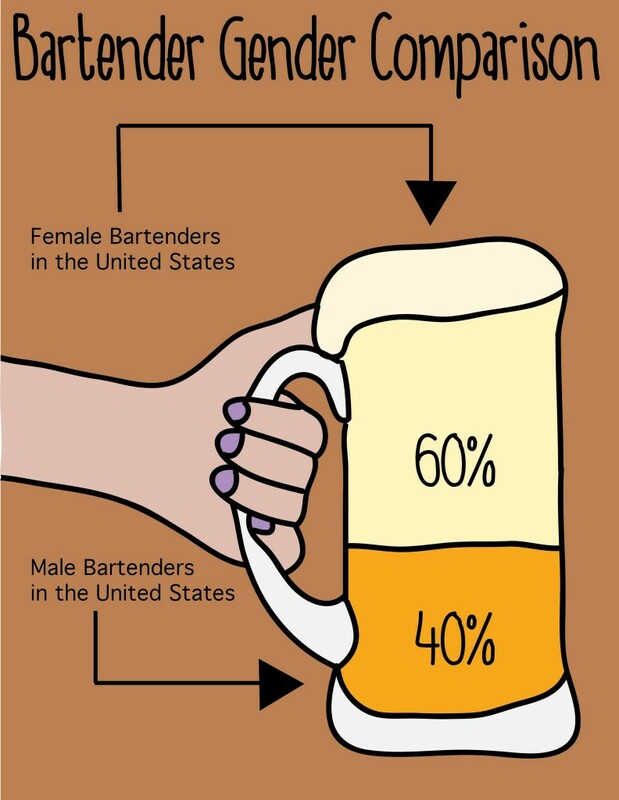 Although the restaurant industry in the United States is dominated by males, women seem to shine in the closely related bartending profession. However according to the Bureau of Labor Statistics, female brewers are much harder to come by making up only one percent of the trade. Austin is home to countless bars, pubs and breweries. Many of these establishments are either owned or operated by women with a passion for serving up the most unique beverages they can compose. Click the names in the photo captions below to see how these local women view their industry. 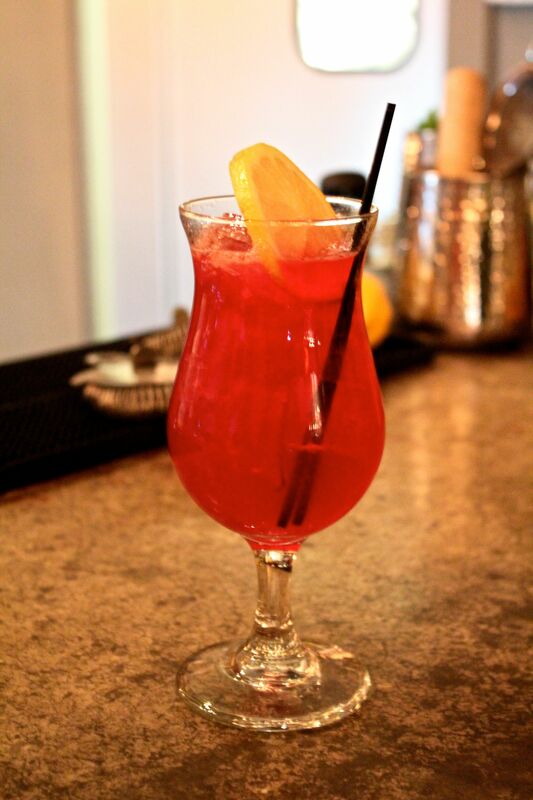 Pam Pritchard, owner and bartender of Tigress, a craft cocktail pub, associates her job with hospitality, something she believes women are known for. “It goes back for ages, [women] are the ones that welcome people in,” Pritchard said. 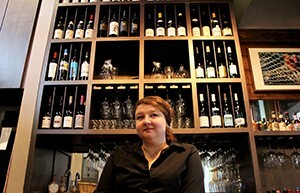 And she believes the desire for hospitality has really brought more women into the business. “Not that men aren’t hospitable… but there is a general perception, if it is a woman, [she] is going to be more nurturing,” Pritchard said. Pritchard also believes women actually see this as a career now, rather than a part-time job. Pritchard grew up in Santa Barbara, Calif. She attended Cal Poly San Luis Opiso and graduated with a microbiology degree. Pritchard started her career as a medical technologist, which took her to hospitals, clinics and a biotech company. But Pritchard was ready for a something different. “I had already done everything there was to do in that career,” Pritchard said. Cocktails and craft beers grabbed Pritchard’s attention. “I was really intrigued by different liquors’ distillations,” Pritchard said. The live music scene attracted Pritchard to Austin, and with her mom’s inheritance, she saw a good window of opportunity. 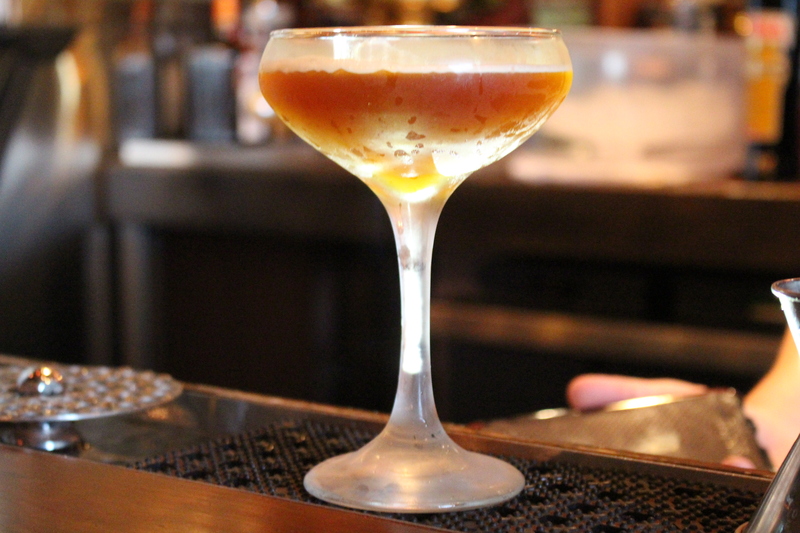 When Pritchard arrived in Austin, craft cocktail programs mostly existed in restaurants. Now the craft beer and cocktail industry has risen. Pritchard credits David Allen, from Tipsy Texan, for her knowledge on spirits. Allen started a class in the community teaching about spirits, including techniques and recipes for drinks. “So many bartenders that are shining stars in the community today took that first class,” Pritchard said. However, Pritchard brought some of her own knowledge into the industry as well. Pritchard admits owning her own bar brings different challenges every day, but she would not want it any other way. “If it wasn’t a challenge, I would probably be bored and move on by now,” Pritchard said. Lucy Taube loves her job as the cocktail manager at Café Josie in Austin, Texas, but sometimes the fact that she is a woman gets in the way of opportunities for her to interact with customers. In recent years Taube has noticed an increase in the number of women working behind the bar, but that has not changed the way that people approach her- if they approach her at all. “I feel like people, a lot of the times, [would] gravitate towards the guy behind the bar when I was there as well,” Taube said. In the past she has been in positions of power above the men working in her bar. During those times, however, customers would still unknowingly talk to the men behind the counter instead of her. “People would approach the bar and they would always ask the guy behind me, ‘What’s your best wine?’ or, ‘What’s your best whiskey?’ and he had no idea; it would be his first day,” Taube said. 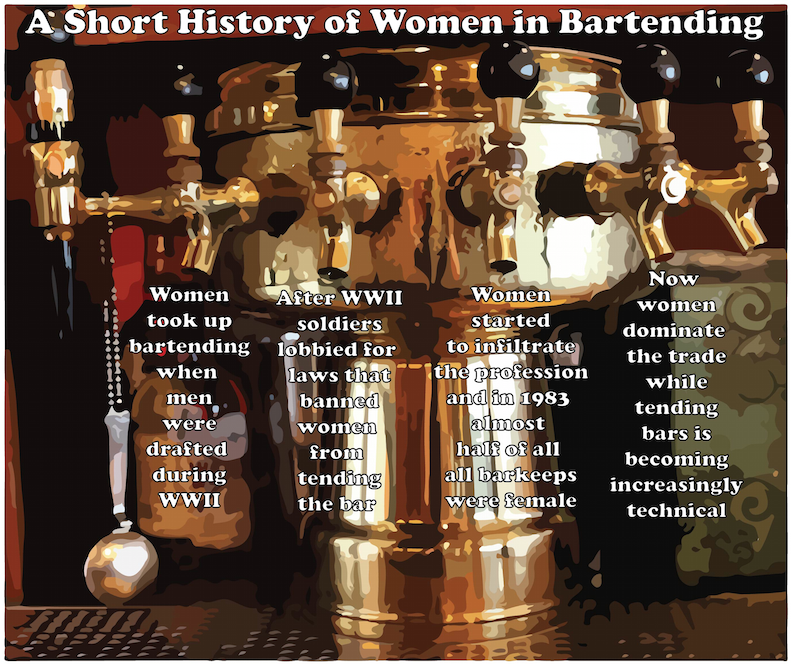 Taube thinks the mindset of assuming men are bartenders is caused by the bartending industry’s historical background. According to Taube, women were not allowed into many bars until the late seventies. Taube is thankful that things are no longer that way, and she is happy to know that the number of women in bartending jobs is rather high. Taube says the increased professionalism of the bartending industry and its emphasis on craftsmanship has made the career path more appealing to women. “I think it’s changed because it’s become more of a skills based industry as opposed to the stereotype of women behind the bar and showing their cleavage,” Taube said. Taube attributes much of her success to the women at the beginning of her career who inspired her to be a better bartender. 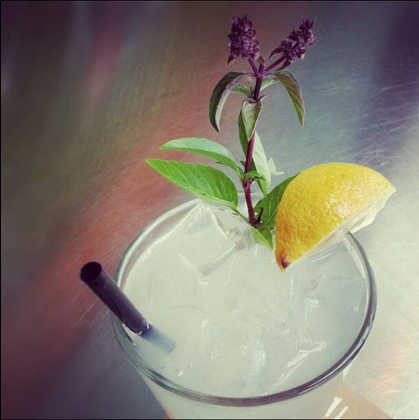 She hopes to inspire younger generations of bartenders to continue the tradition of creating delicious drinks. With her vibrant smile and welcoming charm commanding the bar, it comes as no surprise that Jenn Keyser is a veteran in the bartending industry. She learned from an early age with her father who has owned restaurants her whole life up to this day. Yet the cocktail connoisseur started out with humble beginnings waiting tables in a retirement home. 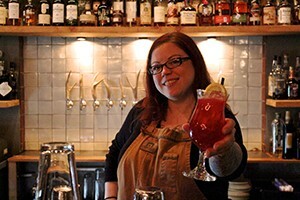 After working her way up with years of hard work and mentoring connections, Keyser found herself immersed in the craft cocktail industry. Keyser said mixology is far more in depth and involved than she ever imagined. 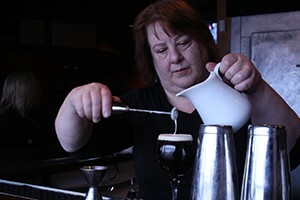 Yet she said the hours she has spent creating and perfecting each drink is appreciated by her loyal customers. Beyond the gratification she receives from serving her unique creations to others, she also enjoys the camaraderie at events like cocktail competitions. However, she notices an inequality amongst her fellow mixologists at these competitions designed for speed and innovativeness. While she said they are usually male dominated, she recently felt relief at a female cocktail competition sponsoring breast cancer. Keyser said she thinks women bartenders are already up and coming. She also said she plans to see more female bar managers like herself in the near future. There’s room for improvement at events like cocktail competitions where she said there is a chance for mentoring and growth. Just as she had to work her way up from the bottom waiting tables, Keyser is optimistic for women’s growth in the industry. In the meantime, the bar manager will continue to share her trade with fellow female bartenders and customers by inventing yet another new beverage, her form of self-expression. Cut into cubes w/ 4 cups of water. Add 1 oz. whole clove, 1 oz. black peppercorn, 3 cinnamon sticks, 2 anisepods & the peels of 3 oranges. Boil for 1 hour and strain liquid. Add equal parts liquid & sugar to finish. 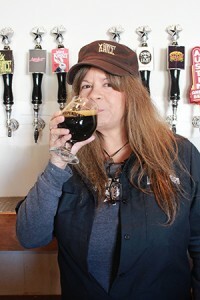 Debbie Cerda has only been working at Independence Brewing for about a month, but she’s known its owners, Amy and Rob Cartwright since 2002, when they met at the Texas Craft Brewers’ Festival, which they were organizing. Their relationship continued into the next few years, Debbie became event coordinator at the festival and even helped with the grand opening of Independence Brewing in 2004. Amy turned an idea she and Rob had in 2001 into a brewing enterprise whose popularity endures in Austin today, and she did it without having reservations about entering a world that was typically male dominated. “I do see that she’s treated a little differently because she’s a female, and people don’t realize who she is, they don’t know the value [of what she’s done],” Cerda said, adding that Amy’s work with Independence Brewing has pushed the craft beer industry in Austin forward. Amy worked tirelessly to get Independence, well, independent. She hit the ground running and didn’t look back. While her husband, Rob, worked in brewing and packaging one of the things she was in charge of was delivery, which she did even while pregnant with her daughter. This work-life balance, however, only made Independence a stronger business. The definition of working parents, Amy and Rob juggle the busy schedules that come with a business as successful as Independence with the busy lives that come from having children under 8 years old. That being said, there’s still a disparity for women in this type of industry because it is very male dominated. Even in organizations like the Pink Boot Society, an organization of female craft beer professionals, there is a belief that women in craft beer are still treated differently, as many believe it’s still a man’s world. Regular and decaf are not your only options anymore and the days of getting endless refills of auto-drip at your local diner are long gone. 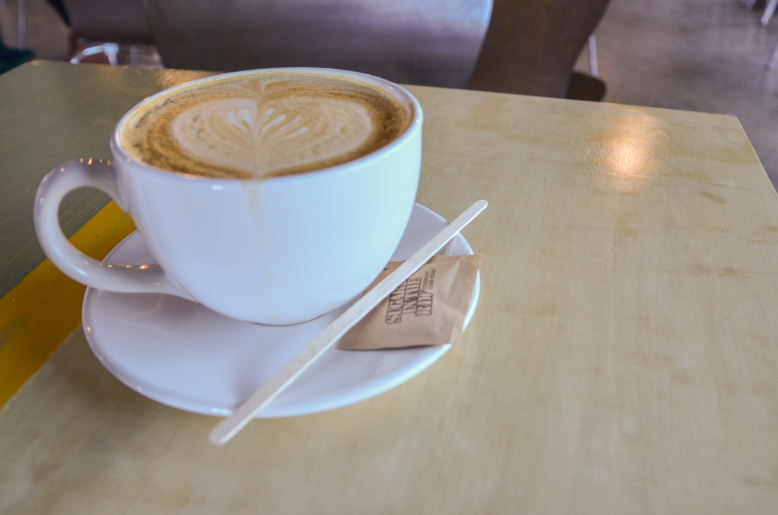 In its place are sleek, trendy coffee shops serving up artisan drinks and a community atmosphere that have reshaped the face of Austin’s urban coffee culture. Consumers are more knowledgeable than ever when it comes to their drinks, the brewing processes and the origin of the beans and the “3rd wave movement” makes it hard for rookie coffee drinkers to get their foot in the door. 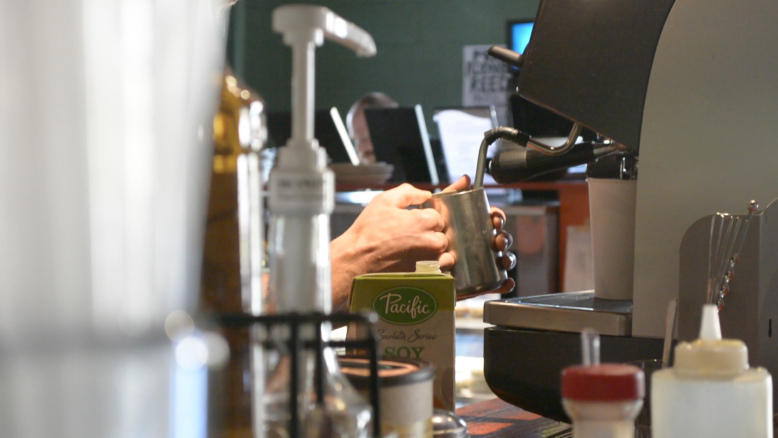 “We are not the pretentious coffee shop,” says Stephanie Williams, co-owner of Bennu Coffee. “We want customers to get a cup that’s higher quality, organic and fair trade, crafted by a barista rather than spit out of an automated machine,” she adds. You can order an espresso, cortado, latte, Americano, cappuccino, macchiato, mocha, drip, cold drip, Chemex, Clover, French press and the list goes on and on. It can be overwhelming to order a drink but this Infovideo makes it easy to understand what goes into an artisan coffee. The coffee shop has never been a place where people only go to get a drink and having a welcoming attitude and the right atmosphere is paramount to getting people in the door. The coffee shop serves multiple purposes. It can be a place for social interactions like dates or interviews, a place for relaxation and reading or a place to get work done. The social aspect of coffee shops is a huge driver of traffic and different shops specialize in meeting their consumers’ every need. Stephanie says coffee shops can focus on live music, the 3rd wave coffee movement, alcohol and coffee, the community and more. “Your coffee shop of choice today says something about who you are or how you want to be perceived,” says Stephanie. The internet has played a huge role in changing how the coffee shop fits into daily life and free wi-fi makes coffee shops an ideal place to work remotely while enjoying a great cup of coffee. 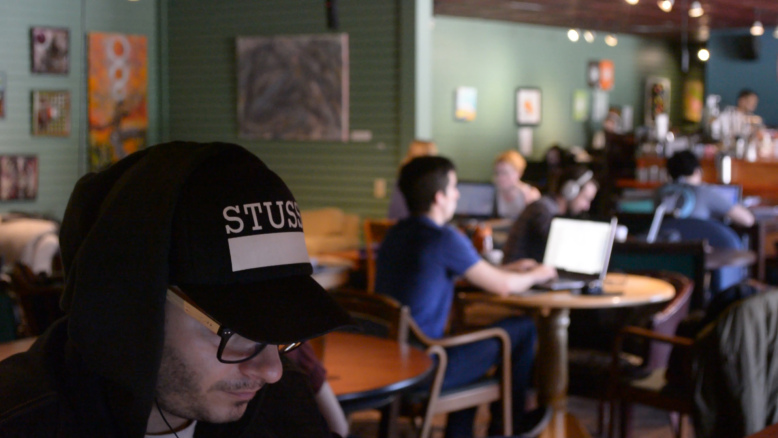 Students and professionals are calling coffee shops home when it comes to meeting that last minute deadline or working on a project. To maintain a professional working environment make sure to follow these tips and tricks from barista’s. Once you have figured out what you want to drink, who you’re meeting or what you have to work on, the only thing left to decide is where you are going to go. Austin has more than its fair share of coffee drinkers and that means there is a coffee shop out there suited to meet everyone’s needs. 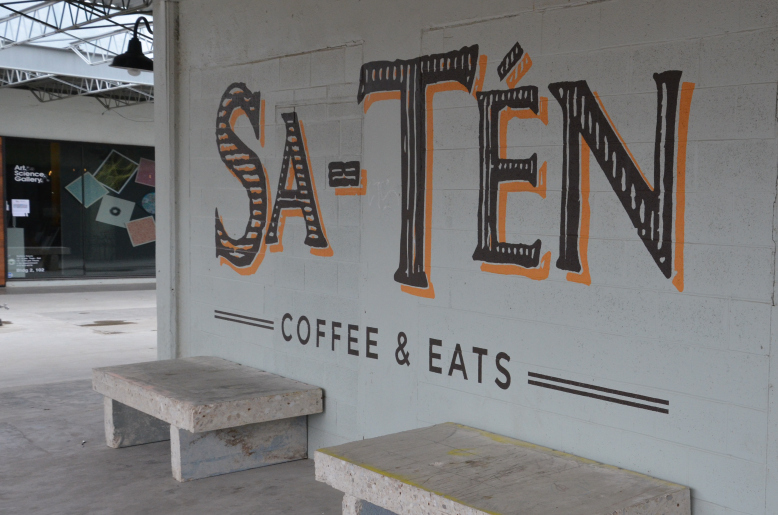 There are many coffee shops in Austin and Stephanie says it is based partly on the entrepreneurial spirit of local coffee lovers who have taken their passion to the next level. “Just like in Seattle, LA, Portland, or New York, Austinites are on the forefront of trends and there is no shortage of coffee knowledgeable entrepreneurs in Austin eager to give the people what they want” she says. No matter what Austinites are doing at coffee shops, one thing is for certain, that they are here to stay and and will continue to be an important part of Austin’s culture for a long time to come. The following map details all of the coffee shops in and around Austin and will help you navigate through each until you find the one that feels right. Cheers! 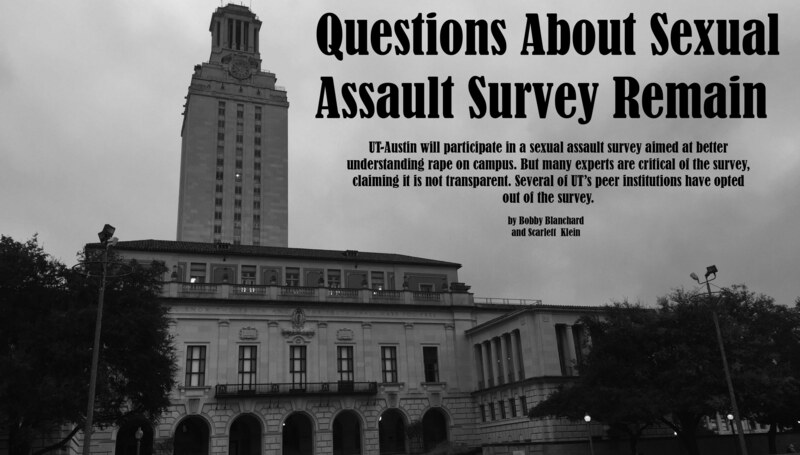 The University of Texas will spend $87,500 to participate in a sexual assault survey that some experts say lacks transparency. Dozens of other schools are opting out of the survey, which is being conducted by the Association of American Universities. Twenty-seven of the 60 Association of American Universities member institutions in the United States are participating in the survey, which would gather information on the location and frequency of assaults. The association announced in November it would conduct the “campus climate” survey by contracting the research firm Westat. “Our primary purpose in conducting this survey is to help our institutions gain a better understanding of this complex problem on their own campuses as well as nationally,” Rawlings said in his statement. But critics of the survey said it would not be helpful for studying sexual assaults on college campuses. Their biggest concerns, critics said, was transparency, citing concerns that only aggregated data will be released from the association as a result of the survey. Data for individual campuses will not be released to the general public for policy experts and researchers to compare, but the AAU will give individual universities their campus-specific data. Select the image below to view an interactive map of universities reporting sexual assault. Red dots are schools participating in the AAU’s sexual assault survey and green dots are non-participating schools. 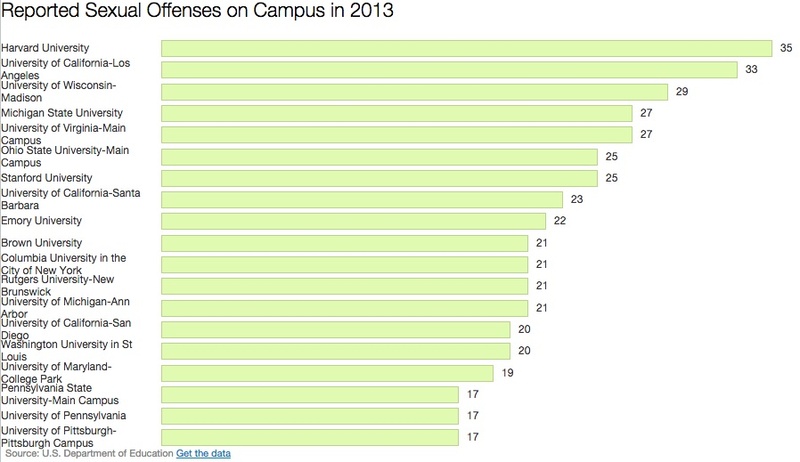 Click the dots to view the number of sexual assaults reported at each university. In addition to activists for sexual assault condemning the survey, experts in academia have expressed concerns over it as well. Sixteen professors across a variety of institutions wrote a letter addressed to the presidents of the Association of American Universities. In their letter, the policy experts said the survey lacked transparency because its questions and methods are secret, and would not be available to the greater scientific community before the survey is conducted. According to data from the U.S. Department go Education, there were just eight sexual assaults reported at UT-Austin in 2013. Some other institutions in the Association of American Universities reported similar numbers, while Harvard University reported as many as 35. In addition to participating with the Association of American Universities, UT-Austin will conduct its won survey, said UT spokesman Gary Susswein. Meanwhile researchers at the School of Social Work have been working on their own study – set to be published in August. 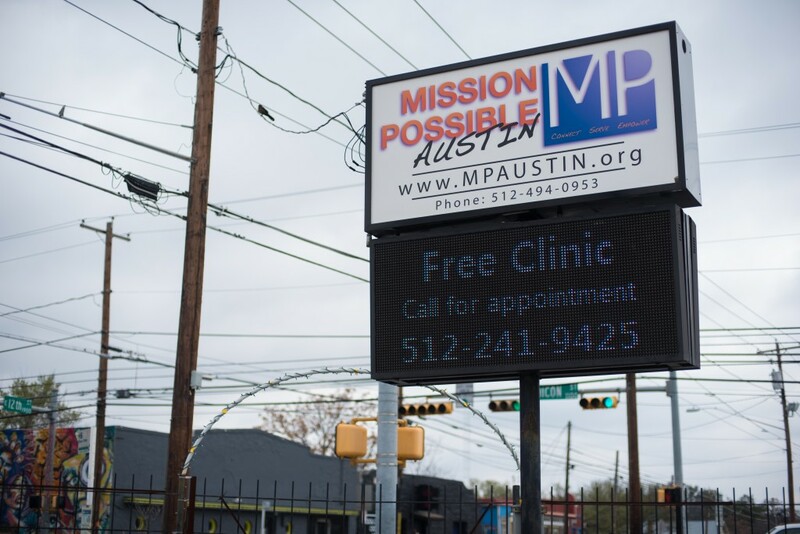 This project was completed by UT-Austin journalism students Bobby Blanchard and Scarlett Klein. Both students did the reporting and worked on the HTML and CSS presentation. Blanchard wrote the story and created the interactive and static graphics. Klein shot and edited the video. Graphics included a Google Fusion table and a datawrapper bar chart. The HTML and CSS design is helped in part by JQuery. The written story is 600 words long.